Continuous improvement is a defining element of Lean. Every day, we seek ways to make things better, easier, less frustrating and more effective. Improvement is achieved through solving problems; and thus, continuous improvement means continuously solving problems. In our latest blog, Training Manager, Eddie O’Neill, gives his advice on how to take the pain out problem solving. Problems in the workplace can be overwhelming, but the reality is, they arise all the time. Lean pioneers, Toyota, are known to say: “no problem is problem.” So don’t get worn down by the prospect of needing to solve problems; problems should be celebrated. When you stop fixing problems, you are not improving, you’re standing still. Standing still is a bad place to be. Lean practitioners use a myriad of models, frameworks, methodologies and approaches to develop problem solving skills. Whichever method you use, one thing’s for sure: it helps to have a structured approach to aid clarity and consistency, provide a vocabulary for collaborating on problems and yield a more effective and richer outcome. Personally, I like the A3 approach to problem solving. Working through a problem on one A3 size sheet seems deceptively simple, but when put into practice, it can be a game changer. While at the surface, an A3 deals with the problem at hand, a very significant emphasis is placed on the process and thinking behind the problem solving activity. The A3 method demands that you refine information to only that which describes the essence of your problem. You use data rather than description, a summary of conclusions as opposed to background information, pictures rather than words. If you’re unable to get the information onto one page, you have a surplus and you need to develop your thinking further to really get to the heart of the matter – revealing your thinking about a situation not just providing data on the problem. Any good problem solving approach starts with a forensic understanding of the problem you’re trying to solve, or the opportunity you’re trying to realise. What pain will this work alleviate? Try to write this down in one sentence; if you can’t, you may not be clear enough on the problem. The sentence should contain “pain words”; examples may include: downtime, rejects, defects, absenteeism, cost, time on hold, attrition, late delivery, etc. When you’ve figured this out, you can complete the first box of the A3. Now that you’re crystal clear on the pain, you then need to establish the gap – the difference between the current condition of the pain (where things are today) and the target condition (where you need to get to). Current condition may include performance measures and process descriptions, including issues. The target condition describes the destination and may include measures and process conditions. The gap is what you need to understand, articulate and address –expose the issues and obstacles that you need to address. Once the current and target condition boxes are completed, the gap should jump off the page at you. Root causes relate specifically and exclusively to the gap you have identified. Identifying and addressing the root cause is the difference between mere fire-fighting and real problem solving; it is at the heart of A3 progression. You may use whatever data analysis, fishbone, brainstorm or other root causing methods suit you. Determine what root causes the gap uncovered and whether addressing these root causes will eliminate the gap. Only the conclusion of this analysis should find its way onto the page. At the outset, we tend to worry most about solutions, actions or countermeasures (what will we do!?) If you’ve followed the above steps you’ll find that the countermeasures tend to jump into your lap. The choices are usually limited and often obvious. Each root cause will demand and suggest a set of countermeasures, activities that will address the root cause, close the gap and eliminate the pain. Each step depends heavily on working through the previous one, keeping these four tightly linked will assist you in clearly thinking through an A3. The A3 process leads to a problem being solved and also develops the thinking and skills of the problem solver; it is an invaluable problem solving tool. If you haven’t tried this approach, I really can’t recommend it highly enough – I hope it helps you find some jewels amongst your treasure trove of problems. 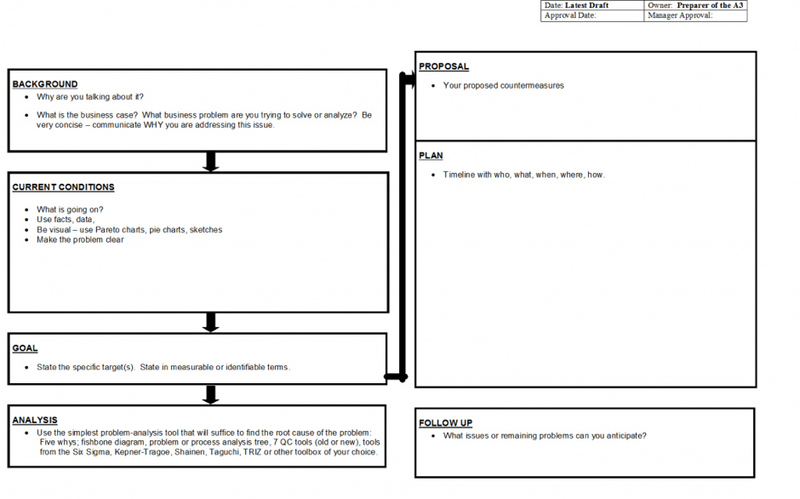 Want to try the A3 problem solving approach with your team? Click HERE for your free A3 Template and give it a go.